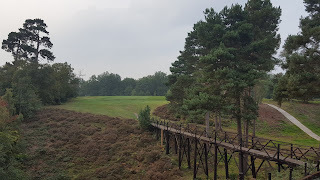 The GSGB September Meeting was held in Croydon at The Addington Golf Club, one of the most attractive heathland courses in England and currently ranked in Great Britain & Ireland's Top 100 courses. Fifty four members even enjoyed a few hours of sunshine but more importantly two days of dry weather to finish off another enjoyable season for the Society. The Addington is a classic Abercrombie design, many would say his best, dating back to 1913 and although not particularly long, offers a tough test of golf with numerous forced carries over heather clad valleys to contend with. Only 10 miles from the centre of London, the course is a haven of heather, bracken, pine and beech with a number of redwoods and other specimen trees adding to its beauty. After Dinner we were joined by the Addington Captain Geoff Dolan who spoke of the club's junior programme and how it teaches golf to kids in the local area. GSGB Chairman Robin Moser presented Geoff with a £500 donation towards the club junior section. The men’s Barlow Seniors Trophy was won by George Clark from Effingham with 64 points and the runner-up was Nigel Hodges from Astbury with 70 points. Nigel had to settle for 2nd place as he is not yet 65 and therefore still too young to take home the Senior Trophy. The Ladies Trophy was won by Christine Hinchcliffe from Sand Moor who scored 61 points and the runner-up was Gill Hodges from Astbury who marginally lost out to Christine on countback. You can view prizewinners and photos of the course here. The opening Meeting of 2018 will be held in Kent at Prince's and Royal Cinque Ports on May 16th - 17th.